288 pages, photos, illustrations and drawings. Including the Benford plywood and epoxy dory designs for Badger and variations from 26’ to 37½’. Annie and Peter Hill voyage on Badger, a Benford 34' Sailing Dory. An income of £1,300 per year lets them do this without worrying about stopping to work. They built Badger themselves, live aboard her, and have sailed her over 125,000 miles. Annie wrote this book to answer all the questions about what they're doing. If you want to follow their wake or set off on your own adventures, there's a wealth of practical information on how-to-do-it here. Unless you are already living on the uttermost boundaries of the monetary system of Western Civilization, you should read Annie Hill's book with greatest caution. 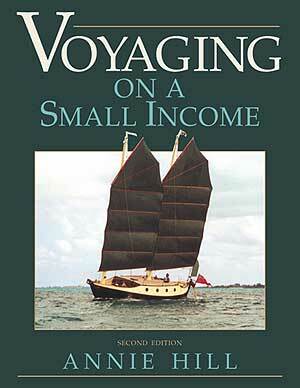 The work you have in your hands purports to offer a series of hints concerning the art of Voyaging On A Small Income. So it does, but if you think that is all you are getting, you have been misled by a remarkably innocuous title. What you are about to read is a volume dealing with the business of sailing in its broadest context, but which also poses a number of serious questions about the true priorities of life for the long-distance mariner. In case this makes you want to dump the thing like a hot ballast pig, don't panic. Annie Hill and her skipper, Pete, are emphatically not "drop-outs", pushing half-baked philosophies to the disenchanted. Annie Hill was born in Liverpool, England, in 1955. Until the age of 18, the nearest she had come to sailing was in the occasional hire boat on Windermere, in the Lake District, where her father taught her to row. While studying to be a chartered surveyor she was persuaded by Pete Hill that she would find ocean voyaging more interesting and doubled the Atlantic in a 28-foot Wharram catamaran in her 21st year. Since 1975 she has cruised and lived on a number of unusual sailing craft and has now sailed over 125,000 miles, crossing the Atlantic sixteen times and visiting a variety of countries from the Arctic to the Antarctic. She hopes to continue voyaging on a small income for the foreseeable future, and maybe even get out of the Atlantic Ocean! Annie and Pete live wherever Badger happens to be. Annie's second book for Tiller Publishing is Brazil and Beyond, in which Badger and her crew are off for the sailing adventure of a lifetime to South America and the Falkland Islands. Annie gives us enough technical information to satisfy any sailor as well as plenty of travel adventure to satisfy the sailor's soul.